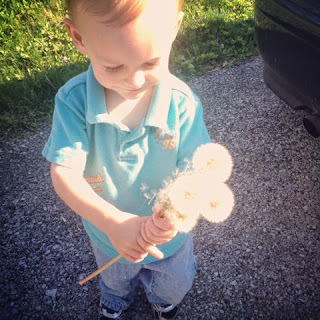 "I got some dandelions for you, Mommy!" 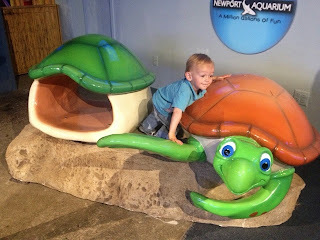 We went to the aquarium today and Ayden LOVED it! He was so excited and enthusiastic about every single room that we entered. Maybe we'll have a marine biologist on our hands someday! He got to touch a starfish (he wasn't a fan of how that felt!) and a turtle! 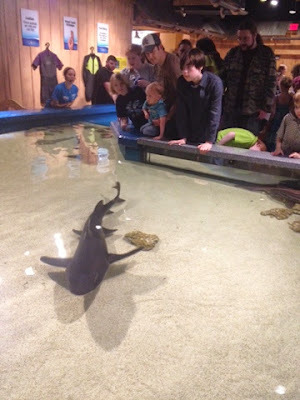 He tried to touch the sharks in the touch tank above but they were too deep for his little arms to reach. It was another long but fun day! 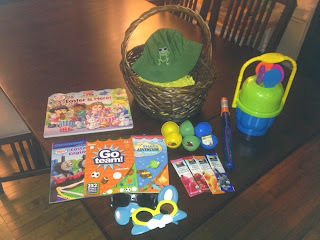 The Easter Bunny has already stopped by our house and I thought I'd give a sneak peak into Ayden's basket. At our house there is a little less focus on candy and more focus on outdoor fun! 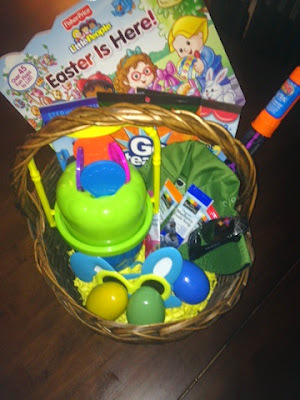 The eggs for his egg hunt are filled with the same things as the eggs in his basket. I think he is going to LOVE it! Can't wait to see his face in the morning. What is in your toddler's Easter basket this year? Flashback! Here's what we were up to one year ago today: "Toad Encounter"
And two years ago today: "Never Too Young"
I finally got Easter Baskets put together tonight. We don't do candy either. I would much rather spend money on practical items! Happy Easter to you all! Easter is all about our Savior, Jesus Christ and the pain he suffered so we could be here today. It's important that we teach our children the whole purpose of Easter. It's a holiday to be centered around Christ. Do you mind me asking what religion you are? I would be happy to send you information about the LDS church. You may have seen our beautiful temples, which is about 147 around the world. Please visit lds.org for more info. You can request Mormon missionaries to give you lessons at anytime.